We use Azure Data Catalog to organize, discover and understand all of our backend data sources. With that in mind, I needed to find a solution where we can automate data source creation (Databases, Tables, etc…) to Azure Data Catalog and don’t want to spend the time creating/registering assets manually. It is a tedious process to manually specially if you have to deal with lots of databases and stored procedures J.
Microsoft exposes an API for you to use and work with Azure Data Catalog. There are plenty of documentation out there but it really took me a while to get everything setup and working correctly. At least from searching on existing assets and registering a new one. This guide will walk you through the steps on registering a catalog asset with additional information to properly authenticate against Azure AD and a modified schema version to include annotations when registering or updating a catalog asset. Note that sample below uses Native Client Authentication to Azure Active Directory. Note: As of writing this blog post, the screenshots below have been taken from the recent UI on azure portal. 4. Click on “Add” and provide a “Name”, “Application Type” and “Redirect UI”. NOTE: The redirect URI is a unique identifier for the client to send the access token back. This doesn’t have to be a valid URI however; you need to keep track of this. You will need it later to authenticate against the catalog api. 1. Click on “Settings” on the newly created app registration. 5. IMPORTANT: Make sure you click on “GRANT PERMISSIONS” once you select “Microsoft Azure Data Catalog” as seen below. If you don’t do this, then your native client will not be able to authenticate properly on the Azure Data Catalog API. The second section talks about authenticating against Azure REST API. Particularly, authenticating against Azure Data Catalog API. The article below will guide you through steps on calling the Azure Data Catalog API via ADAL libraries for authentication. The information presented below from Microsoft’s site is accurate as of this writing. · Don’t use HTTPWebRequest rather use HTTPClient to authenticate. HTTPClient has far more features that HTTPWebRequest. That said, refer to this Microsoft article for examples on HTTPClient. Changes to the request body when registering Data Assets. This is the part where I’ve spend most of my research modifying the schema for registering or updating assets. In this case, adding annotations during the registration process. Microsoft provides basic schema definitions when registering assets but doesn’t provide enough details on other schema values such as annotation experts, tags and description. Here’s a modified version of the schema when registering an asset to include annotations. Putting it all together: Here’s a complete sample on how to invoke the Azure Data Catalog using HTTPClient in C#. // The ResourceURI is used by the application to uniquely identify itself to Azure AD. // The ClientId is used by the application to uniquely identify itself to Azure AD. // The AAD Instance is the instance of Azure, for example public Azure or Azure China. // The RedirectUri gives AAD more details about the specific application that it will authenticate. Title says it all, we have some MVC apps using Azure AD via WSFed and want to convert using OpenID auth. While WSFED works well, we wanted to take a simple approach of using OpenID through Azure AD. These are the steps to either convert from WSFED or add OpenID in existing MVC Apps for Authentication. Sign in to the Azure Management Portal (http://azure.microsoft.com). Once finished, click the arrow icon on the bottom-right corner of the page. On the App properties page, provide the Sign-on URL (URL for your web application) and App ID URI (Unique URI for your application – Usually it’s a combination or your AD domain/application. Example: http://www.domain.com/mywebsite.somedomain.com) for your web application then click the checkbox in the bottom-right hand corner of the page. Your application has been added, and you will be taken to the Quick Start page for your application. Replace the code from below: Be sure to take the whole class definition! 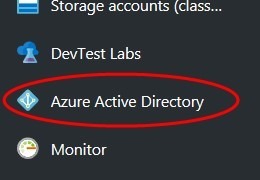 // The Client ID is used by the application to uniquely identify itself to Azure AD. // The App Key is a credential used to authenticate the application to Azure AD. Azure AD supports password and certificate credentials. // The Metadata Address is used by the application to retrieve the signing keys used by Azure AD. // The Authority is the sign-in URL of the tenant. // The Post Logout Redirect Uri is the URL where the user will be redirected after they sign out. // This is the resource ID of the AAD Graph API. We'll need this to request a token to call the Graph API. // If there is a code in the OpenID Connect response, redeem it for an access token and refresh token, and store those away. In the project, create a new folder called Utils, create a class AuthenticationHelper.cs. Replace the code from below. Be sure to take the whole class definition! ///     Async task to acquire token for Application. ///     Get Active Directory Client for Application. In the Utils folder, create a class Constants.cs. Replace the code from below. Be sure to take the whole class definition! In the Utils folder, create three new classes called NaiveSessionCache.cs. Replace the code from below. Be sure to take the whole class definition! // Empties the persistent store. // Triggered right before ADAL needs to access the cache. // Reload the cache from the persistent store in case it changed since the last access. // Triggered right after ADAL accessed the cache. Right-click on the project, select Add, select “OWIN Startup class”, and name the class “Startup”. If “OWIN Startup Class” doesn’t appear in the menu, instead select “Class”, and in the search box enter “OWIN”. “OWIN Startup class” will appear as a selection; select it, and name the class Startup.cs . In Startup.cs , replace the code from below. Again, note the definition changes from public class Startup to public partial class Startup . Add a new empty MVC5 controller UserProfileController to the project. Copy the implementation from below. Remember to include the [Authorize] attribute on the class definition. // Retrieve the user's name, tenantID, and access token since they are parameters used to query the Graph API. // Call the Graph API manually and retrieve the user's profile. // Return the user's profile in the view. // If the call failed, then drop the current access token and show the user an error indicating they might need to sign-in again. // Send an OpenID Connect sign-in request to get a new set of tokens. // If the user still has a valid session with Azure AD, they will not be prompted for their credentials. // The OpenID Connect middleware will return to this controller after the sign-in response has been handled. // The user needs to re-authorize. Show them a message to that effect. Add a new empty MVC5 controller AccountController to the project. Copy the implementation from below. // Send an OpenID Connect sign-in request. // Remove all cache entries for this user and send an OpenID Connect sign-out request. If you want the user to be required to sign-in before they can see any page of the app, then in the HomeController, decorate the HomeController class with the [Authorize] attribute. If you leave this out, the user will be able to see the home page of the app without having to sign-in first, and can click the sign-in link on that page to get signed in. In web.config add this line in the <system.web> section: <sessionState timeout=”525600″ /> . This increases the ASP.Net session state timeout to its maximum value so that access tokens and refresh tokens cache in session state aren’t cleared after the default timeout of 20 minutes. DTan's Blog Blog at WordPress.com.